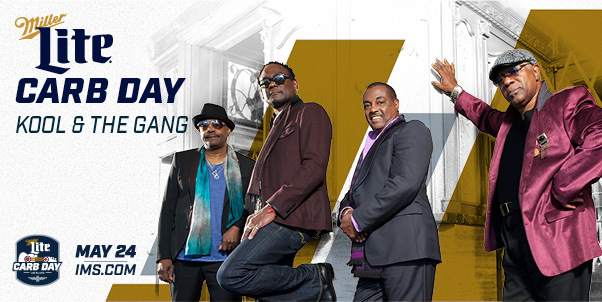 Kool & the Gang, which has received countless awards for its chart-topping funk, R&B and pop hits, will open the Miller Lite Carb Day Concert on Friday, May 24, 2019 at the Indianapolis Motor Speedway. Rock band Foreigner is headlining the show on one of the most exciting days in the Month of May at the Indianapolis Motor Speedway, creating a legendary show featuring two of the biggest-selling groups in musical history. The concert starts at 3:30 p.m. on the Miller Lite Stage inside Turn 4 of the IMS oval. Tickets are on sale now at IMS.com, by calling 800-822-INDY (4639) or 317-492-6700, or by visiting the IMS Ticket Office at the IMS Administration Building. General Admission prices start at $30. Special Concert Pit access also is available for an additional $20, and a limited number of VIP Deck tickets are available for $250. Kool & the Gang, officially launched in 1969, after performing for five years under various band titles, has influenced the music of three generations while becoming true recording industry legends. Thanks to iconic songs like “Celebration,” “Cherish,” “Jungle Boogie,” “Summer Madness” and “Open Sesame,” they’ve earned two Grammy Awards, seven American Music Awards, 25 Top Ten R&B hits, nine Top Ten Pop hits and 31 gold and platinum albums. From Nairobi to Newark, Kool & the Gang has performed continuously longer than any R&B group in history, and its bulletproof funk and jazzy arrangements have also made it the most sampled R&B band of all time. A reviewer recently called their performance “a 24-karat show” and every year, even after a half-century on the road, yields a non-stop schedule of shows across the globe. In 1964, Ronald Bell and his brother, Robert “Kool” Bell, joined Jersey City, New Jersey, neighborhood friends Robert “Spike” Mickens, Dennis “Dee Tee” Thomas, Ricky Westfield, George Brown and Charles Smith to create a unique musical blend of jazz, soul and funk. At first calling themselves the Jazziacs, the band went through various names – The New Dimensions, The Soul Town Band, Kool & the Flames – before settling on their famous moniker. Over the next several years they solidified their musical chemistry on the rough-and-tumble East Coast music scene supporting acts like Ritchie Havens and Richard Pryor. Their self-titled 1969 debut album introduced their signature instrumental sound and fierce horn arrangements and spawned their first Billboard R&B charted single, Kool & the Gang. The band’s stellar reputation grew with each album, but 1973’s gold disc “Wild & Peaceful” took Kool & the Gang to another level (No. 6 R&B, No. 33 Pop), spurred by the immortal party anthems “Funky Stuff,” “Hollywood Swinging” and the platinum smash “Jungle Boogie.” Hits like Higher Plane (No. 1 R&B), the classic “Summer Madness” (featured on the Grammy-winning movie soundtrack “Rocky”) and LPs “Spirit of the Boogie,” “Love & Understanding” and “Open Sesame” followed. The latter’s title track was featured on the top-selling movie soundtrack of all time, “Saturday Night Fever,” earning the group their second Grammy. In 1979, Kool & the Gang unveiled a smooth new sound with “Ladies Night.” Produced by the legendary pop/jazz musician Eumir Deodato, it became their first platinum album. The No. 1 R&B title track reached No. 8 on the Pop chart. It was followed by “Too Hot” (No. 3 R&B, No. 5 Pop). The 80s would see them dominate the mainstream, starting with the double platinum-selling album “Celebrate” (driven by the international monster hit “Celebration,” which spent six weeks atop the R&B chart and became a No. 1 Pop single). “Celebration,” which played as the American hostages returned from Iran, remains de rigueur at joyous occasions worldwide. The smashes “Get Down On It,” “Take My Heart,” “Let’s Go Dancing,” “Joanna,” “Tonight,” “Misled,” the No. 1 R&B, No. 2 Pop giant “Cherish” and the No. 1 R&B anthem “Fresh” (these last three from the multi- platinum LP “Emergency”) solidified the group’s international stardom. With the explosion of hip-hop in the 90s, Kool & the Gang’s incredible catalog of grooves made them DJ favorites. They were second only to R&B icon James Brown as sources of rap music samples. Today, the group enjoys global fame and recognition and a following that spans generations due in part to the group’s widely sampled catalogue. Kool & the Gang’s drum beats, bass, guitar and signature horn lines lace the tracks of numerous artists, including the Beastie Boys, Jay-Z, Madonna, Janet Jackson, Cypress Hill, and P. Diddy. Kool & the Gang is the most sampled band in hip-hop by far. The band’s music is also featured on the soundtracks for “Rocky,” “Saturday Night Fever,” “Pulp Fiction,” “Wreck-It Ralph” and countless others. In 2014, the band was honored with a BET Soul Train Lifetime Achievement Award and in October 2015, in the town they sing about in one of their earliest hits, “Hollywood Swinging,” Kool & the Gang was honored to take their place as American musical icons with a star on The Hollywood Walk of Fame.